It's easy to join our academy. You can contact our Professional Staff on 0191 378 0029-2 to arrange to sign your child up. Cost to join: £25 including a welcome pack. If your child is aged between 6 - 18 they are eligible to join. How are age groups split? Participants will be split into small groups at different times on Saturday, to allow for personalised coaching. Apart from a pair of good grippy trainers or astro turf boots, nothing else is needed. 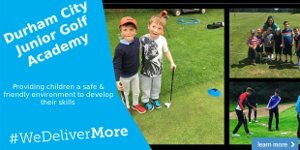 We have golf clubs ready to suit all sizes and dexterity so no need for them. What does Academy Membership give you? - Set on a pathway of progression towards good golf! Don't hesitate to get in touch and join in! !